In an earlier article outlining the background to the opposition campaign to today's EDL protest in Bristol, it was shown that elements of the anarchist and Trotskyist fringe were intent upon whipping up an atmosphere of hatred in Bristol today and instigating violence. Tweets from This is Bristol's Emily Koch suggest that at the time of writing the police were still seeking to contain violence seemingly emanating from the self-styled 'anti-fascist' opponents of the EDL. Avon and Somerset Police did their best today to keep the EDL and anti-EDL protesters apart, but the latter appear to have violated the instruction not to assemble at 'The Fountains', resulting in the arrest of previously convicted violent anti-democratic agitator Martin Smith of UAF. It is the anarchist contingent within the anti-EDL coalition that had been most intent upon violence, and which was unwilling to move the location of the counter-protest to the place specified by the police. At this stage, it still has not been revealed who issued the death threats against two members of the EDL in advance of today's protest, which resulted in the issuing of Osman warnings this week, so the threat could have emanated from an element within the violent 'antifa' fringe, rather than from Islamists. Although thankfully there have been no deaths today, there have been a number of injuries. The video below shows mounted police dispersing 'antifa' demonstrators. Such tactics were not required against the EDL. All in all 11 arrests, including Martin Smith of UAF, were made. Riot police made the arrests as up to 300 English Defence League (EDL) demonstrators marched through the city. 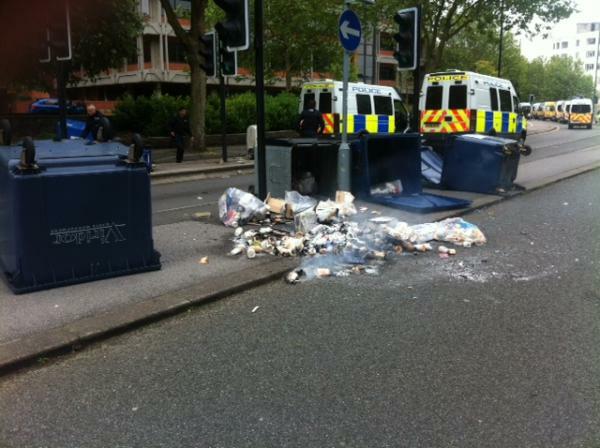 Some of the demonstrators threw objects and wheelie bins were set on fire. What impression is conveyed by these two sentences? Who does it imply committed these acts? EDL demonstrators, or their opponents? In all, the BBC reports that 14 arrests were made, but as is standard in reporting on the EDL, no reference was made to who had been arrested, with the implication being that the majority, if not all of those arrested, were EDL supporters. Why did it not mention that Martin Smith of UAF was the first to be arrested? Given his high profile in UAF, surely this was worthy of comment? One claim has circulated that only two of the 14 arrested hailed from the EDL, with the remainder coming from the ranks of their opponents, which given the violence of the latter, seems credible. This claim will either be corroborated or proven false when the identities of those arrested are released, but the experience of previous demonstrations indicates that the bulk of those arrested are likely to be counter-demonstrators. Further information relating to the essentially peaceful conduct of the EDL demonstrators, in contrast to the unprovoked violent attack upon the police by the self-styled 'anti-fascists', was published in a report by This is Bristol on Monday 16 July. This underscores the point that it is not the EDL - the so-called 'far-right' - that constitute a threat to our liberties and freedom of expression, but the Trotskyist and anarchist hard Left who do not believe in pluralism, and who are eager to resort to violence to close down debate. People need to understand that behind the words calling for alleged 'tolerance' and 'respect' employed by the hard Left, there lurks a nasty and violent totalitarian impulse, and you don't have to scratch too hard for it to reveal itself. The passionate left wing obsession to embrace Islam is a mystery. Not least because of the intolerant nature of that creed. Especially towards women and gays. Exactly. If the muslims ever came to power in this country and that prospect can't be discoutered due to their rising demographics then serious harm is the prospect gays face. If Nationalist parties changed their stance on this issue then perhaps they would get more support from that quarter. The furthest 'Right' that some gays vote for in Britain is for UKIP - a party which doesn't take the threat of Islamification seriously. Old Rightie, the Left's embrace of Islam is indeed perplexing and utterly illogical, and only seems to be explicable through reference to an intense and irrational hatred of our own society, culture and people, or "oikophobia" as Roger Scruton has termed it (by which he does not imply an aversion to the great unwashed!). Barry, what you say is true, but most people cannot be bothered to look past what is peddled day in and day out by the mass media. As for nationalist parties, there are not any currently worth bothering with, but as you know, something new is coming shortly (see in my reply to you below and in a forthcoming article later this week). The Left loves Islam because of it's potential to disrupt society and therefore be an agent of change. Read Chris Harman's "The Prophet and the Proletariat" below where he implores the Left to ignore Islam's propensity to fascism for the greater good of their movement. and then google Chris Harman's obituary, to see what our leading journalists thought of him. Thanks for the link. I shall read it with interest. Well, The Guardian certainly seemed to love him, which comes as no surprise. What an 'exciting' life he led: presiding over the publication of a fifty-volume edition of the collected works of Marx and Engels! remember the old arab adage;"the enemy of my enemy is my friend"? islam will embrace anyone as a comrade, so long as the enemy is a common enemy. they will turn on their "comrade" as soon as the common enemy is defeated. the left are too hungry for power to realise the kind of "friend" they have made. Historic and ideological links, perhaps? ...During World War II he actively collaborated with both Nazi Germany and Fascist Italy, meeting Adolf Hitler personally and asking him to back Arab independence. He requested, as part of the Pan-Arab struggle, Hitler's support to oppose the establishment in Palestine of a Jewish national home. He was promised the leadership of the Arabs after German troops had driven out the British. He helped recruit Muslims for the Waffen-SS. At war's end, he came under French protection, and managed to slip away to Cairo to avoid eventual prosecution." Radical lefties cannot see human nature as it is. Otherwise it would be obvious to them what they stand for will not ever be willingly accepted by rational people. So it is with their willing suspension of belief in what Islam teaches and that they are nothing but disposable useful idiots. True. Generally speaking, they seem to believe that there is one single "human nature", whereas there are almost as many human natures as there are individuals, owing to our different genetic inheritances and life experiences. As for the Trotskyists, their alliance in this country and elsewhere in Europe with Islam is purely opportunistic, but given that at least here Muslim responsiveness to their appeals to mobilise them as a proxy "revolutionary" shock force appears to be failing, they may change tack in the years ahead. The entire worldview of the Trotskyist seems to be built upon an intense self-hatred, a "love" of humanity in the abstract, but a loathing for humans as concrete individuals unless they happen to belong to a designated "victim" group. The Left embraces islam as political bedfellows simply because both have the common goal of the demise of the West. The muslims, for their oft stated goal of islamisizing the world. The Left for the overthrow of Capitalism. In the event that they are successful, there will eventually have to, then, be a fight between the two, to determine who would rule over the wreckage. I agree Bruce. The two are locked, for the time being at any rate, in an unholy alliance. Given the period of protracted crisis that we appear to be entering, the future is not looking rosy. leftists are shameless. they don't exist in any muslim majority country but still collaborate with muslims. Witness the fate of the Iranian communists, comrades in arms with the Islamists in the revolt against the Shah. When is this new party going to be formed? Time is running out and the BNP is broken beyond all repair whilst Nick is still at the helm. I am a former BNP member and I want to be able to support a viable nationalist party as my country is in a very serious predicament at the moment and the time should be right for a credible party. Barry, I must apologise for those of us involved in the new party being a little behind schedule. I will be posting properly on party developments towards the end of the week, but please be reassured that it is going ahead. There have been a couple of delays for unforeseen reasons (life has a habit of throwing up obstacles for people), but the registration documentation should be submitted to the Electoral Commission this week, so as soon as the party has been approved, its name will be released and we will be open for membership. If however you would like to leave your contact details marked 'Not for publication' in the comments section, I would be happy to contact you and explore how you would like to become involved, if that is, you wish to do something over and above signing up for membership. It's good to hear the news about the new party, though it doesn't sound as if Mr Brons is in support. It seems he's ready to throw in the towel. It is terrible to have to say this but if your new party doesn't take off, there is nothing to stop the destruction of our country as we know it. Thanks Constip. Your support is appreciated. Having read a recent post by Brons on his site, I see that he is still convinced, rather like Private Frazer, that "we're all doomed", but I possess a rather more sanguine outlook. It is understandable that he personally may despair of the political situation and has become fatigued with politics, but our respective analyses diverge somewhat, which accounts for our different conclusions. I will be addressing his bleak prognosis in the article later this week, and although both our political and meteorological situations are currently gloomy, come the autumn, I think that things will be looking rather better. If Counter-Jiahdi's made it very clear that they do not tolerate criticism of ritual slaughter, two objectives could be reached. Many antifas are, in their spare time, animal rights activists. In the Netherlands, an animal rights party, Partij voor de Dieren, proposed a ban on ritual slaughter. This forced Jews and Muslims to cooperate. But it did create a rift between Muslims and the Left, fostered by a well-placed sticker campaign from my side. The other objective is that Jews would have less reason to fear the counter-jihad movement. At any rate, ritual slaughter of animals is one of the least repulsive aspects of Islam, but one very much cherished even by the most moderate ones. Attacking ritual slaughter is extremely stupid. You are rather missing the point. What makes you think that I care not for animal welfare? I'm an atheist too, so why would I want to defend any unjustified suffering through reference to supposedly 'divine' texts, of whatever provenance? The Muslim affair with the soi-disant antifas is already coming to an end, although the latter do not realise it yet. Interesting, to see that the affair with the antifas is coming to an end; why? Many so-called 'Animal Rights' activists are nothing of the sort. They are simply full time agitators with scant genuine regard for animals (much like how most hunt protesters are more interested in the trouble they can cause than the welfare of foxes). This is proved by them stubbing their cigarettes out on police horses to try and make them throw their mount. Sickening. Yeah, full time agitators. That is why they are really dangerous.